*This update contains stability improvements and general bug fixes. Calling all Super Heroes!The interdimensional being Omega has settled in Silver City to bring chaos and destruction. Crime is through the roof!Take Mr. Sunshine and his incredible powers and build a team of Heroes known as The Sentinels to take back the city from evil.From Kitty Karma to Beaver Boy,... xem thêm Calling all Super Heroes! The interdimensional being Omega has settled in Silver City to bring chaos and destruction. Crime is through the roof! Take Mr. Sunshine and his incredible powers and build a team of Heroes known as The Sentinels to take back the city from evil. From Kitty Karma to Beaver Boy, rally the Heroes and save the world! Join a Global Alliance, battle in the Silver City Super Bowl, climb your way through Titan Tower and take on challenges from the Helipad. Battlehand Heroes is an all new adventure, with AAA graphics, hilarious animations, and the ability to be just a little more super than you are in normal life. Join the fight today in BattleHand Heroes! * Epic free-to-download strategy adventure RPG (Role Playing Game). 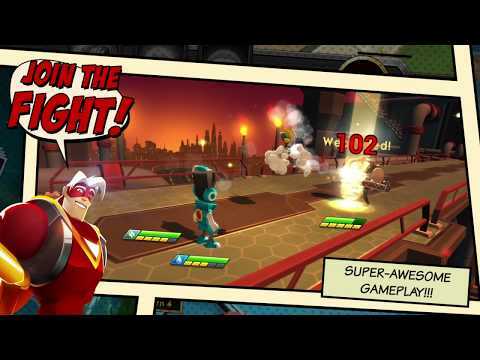 * Recruit a team of legendary Super Heroes to save Silver City! * Unlock incredible upgrades through each Hero&apos;s skill tree. * Multiple battle modes, including a Robust Campaign and Player vs. Player challenges. * Collect, level up, and evolve powerful cards on your way to build the perfect Super Team. * Adventure all over Silver City in the name of Justice! * Perfect your combat strategy using elemental strengths and weaknesses for all Heroes and Villains. * Stunning 3D animation and easy to learn tactical combat. PLEASE NOTE: BattleHand Heroes is free to play, but some extra game items can be purchased for real money. You can disable in-app purchases in your device&apos;s settings.